27542 A woman drawing water from a well under an arcade mk56 oil on panel. 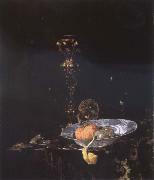 1619-1693 Dutch Willem Kalf Galleries Willem Kalf was born in Rotterdam, in 1619. He was previously thought to have been born in 1622, but H. E. van Gelder? ?s important archival research has established the painter? ?s correct place and date of birth. Kalf was born into a prosperous patrician family in Rotterdam, where his father, a cloth merchant, held municipal posts as well. In the late 1630s, Willem Kalf travelled to Paris and spent time in the circle of the Flemish artists in Saint-Germain-des-Pr? ?s, Paris. In Paris he painted mainly small-scale rustic interiors and still-lifes. Kalf? 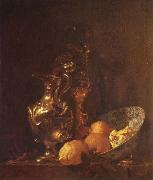 ?s rustic interiors are typically dominated by groups of vegetables, buckets, pots and pans, which he arranged as a still-life in the foreground (e.g. 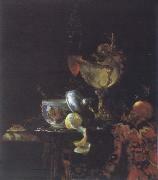 Kitchen Still-life, Dresden, Gemäldegal; Alte Meister). 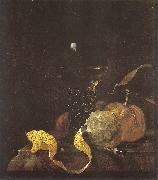 Figures usually appeared only in the blurred obscurity of the background. Though painted in Paris, those pictures belong to a pictorial tradition practised primarily in Flanders in the early 17th century, by such artists as David Teniers the Younger. The only indication of the French origin of the paintings are a few objects that Flemish exponents of the same genre would not have pictured in their works. Kalf? 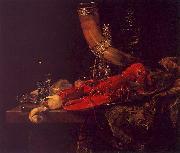 ?s rustic interiors had a large influence on French art in the circle of the Le Nain brothers. The semi-monochrome still-lifes which Kalf created in Paris form a link to the banketjes or 'little banquet pieces' painted by such Dutch artists as Pieter Claesz, Willem Claeszoon Heda and others in the 1630s. 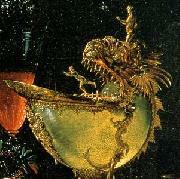 During the 1640s, Kalf further developed the banketje into a novel form of sumptuous and ornate still-life (known as pronkstilleven), depicting rich groupings of gold and silver vessels. 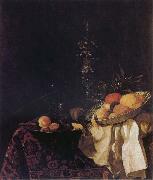 Like other still-lifes of this period, these paintings were usually expressing vanitas allegories.